The University of Mississippi has announced a new plan to foster a more inclusive and welcoming environment on campus. Perhaps the most controversial part of the plan is addressing the use of the term “Ole Miss” to refer to the university. Students from two historically Black educational institutions in Mississippi – Jackson State University and Tougaloo College – participated in a 10-week program this summer involving prostate cancer research at the University of Mississippi Medical Center. Edward Vaughn was a professor of education at Alcorn State University in Mississippi. Before coming to Alcorn State in 2004, Professor Vaughn was director of institutional research at Lane College in Jackson, Tennessee. Adebayo Oyebade, a professor of history at Tennessee State University in Nashville, and Derrick Harriell, an assistant professor of English and African American studies at the University of Mississippi, have been honored. A noose and an old Georgia state flag containing the Confederate Stars & Bars was placed over the statue of James Meredith on the campus of the University of Mississippi. The two perpetrators were heard yelling racial slurs. The University of Mississippi has received letters written by President John F. Kennedy and Attorney General Robert F. Kennedy that dealt with the integration of the Ole Miss campus. Debra M. Brown, a graduate of the School of Architecture at Mississippi State University and the law school at the University of Mississippi, is the only attorney in the state that has a degree in architecture. Both the University of Mississippi and historically Black Jackson State University have record numbers of students on campus this fall. Blacks make up more than 15 percent of the students at Ole Miss. The honorees are Janice R. Franklin of Alabama State University, Jack Thomas of Western Illinois University, civil rights icon Myrlie Evers-Williams, Gladius Lewis of the University of Memphis, and Isaac Crumbly of Fort Valley State University. An Obama campaign poster was burned at the rally and students reportedly shouted racial slurs. Two arrested were made on disorderly conduct charges. A half century after James Meredith was the first Black student at Ole Miss, RoSusan Bartee is the first African American full professor in the department of leadership and counselor education at the university. 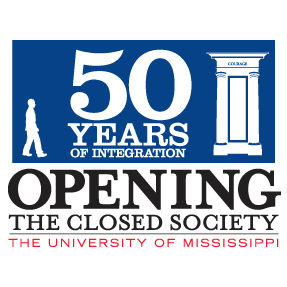 The University of Mississippi has held a series of events commemorating the racial integration of the university 50 years ago. Bishop Duncan Gray Jr.’s collection includes hundreds of letters in support and in opposition to his stance that racial segregation was incompatible with the Christian faith. Courtney Roxanne Pearson, a senior from Memphis, will be crowned on October 13 during halftime ceremonies at the football game between Auburn University and Ole Miss. On average, about 50 African Americans earn a Ph.D. in chemistry every year. This year three of them are at the University of Mississippi. Fifty years ago there were no Black students at Ole Miss. Today they make up 16 percent of the undergraduate student body. Kimberly Dandridge is a rising senior majoring in journalism with a minor in sociology. She hopes to enroll in law school. A longtime educator, he was the second African American graduate of the University of Mississippi.